Pope Francis told leading oil executives Saturday that the transition to less-polluting energy sources ‘is a challenge of epochal proportions’ and warned that satisfying the world’s energy needs ‘must not destroy civilization.’ The Vatican said Francis held a two-day conference with the executives as a follow-up to his encyclical three years ago that called on people to save the planet from climate change and other environmental ills. Participants included the CEOs of Italian oil giant ENI, British Petroleum, ExxonMobil and Norway’s Statoil as well as scientists and managers of major investment funds. Their remarks on the first day of the closed-door conference were not released by the Vatican. “Civilization requires energy, but energy must not destroy civilization,” he implored. Energy experts and those who advocate fighting climate change expressed doubts before the conference that it would amount to anything other than a PR opportunity for the companies to burnish their image without making meaningful changes. In his remarks, the pope said he hoped the meeting gave participants the chance to “re-examine old assumptions and gain new perspectives.” Francis said that modern society with its “massive movement of information, persons and things requires an immense supply of energy.” And still, he said, as many as one billion people still lack electricity. Frances also recalled his own appeal in the ‘Laudato Si’ encyclical for an energy policy ‘aimed at averting disastrous climate changes that could compromise the well-being and future of the human family, and our common home.’ That includes transitioning to efficient, clean energy sources. 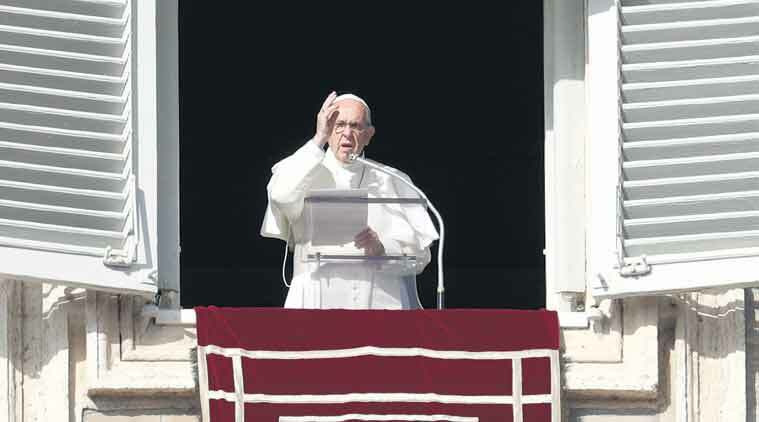 The pope called for a ‘long-term global strategy to provide energy security,’ along with ‘precise commitments’ to tackle the challenge of climate change. He said it was “disturbing and a cause for real concern” that the levels of carbon dioxide emissions and the concentrations of greenhouse gases remain high despite commitments taken in the 2015 Paris accord to fight global warming. He urged participants to use their ‘demonstrated aptitude for innovation’ to address “two of the great needs in today’s world: the care of the poor and the environment.” He noted that the poor pay the highest price for climate change, often being forced to migrate due to water insecurity, severe weather and an accompanying collapse in agriculture.